Via Noah Budnick. 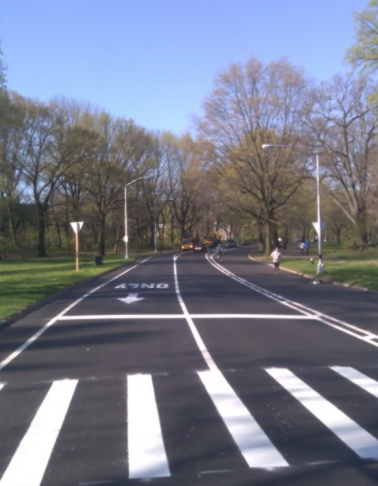 It looks like the new road design in Prospect Park will be ready sometime this week, although I’m assuming it depends on when they can paint bicycle and pedestrian symbols on the ground. As you can see from the picture in the background, cars are still driving in two lanes. While I’m glad to see things moving in this direction, it’s important to ask how that white stripe of paint in the middle will protect cyclists, runners, and pedestrians from drivers using the park as a raceway. I hope they turn off the traffic lights when the commuter cars are not there.